= Print is available framed straight from the publishing company. = Print is selling below its original issue price for sale purposes. = Print is selling at its original issue price. = Print is selling above its original issue price because either the distribution center has raised its prices or the publishing house is sold out of the print. = An open edition print signed by the artist but not numbered. They are printed on a lighter weight paper stock and are smaller in size than limited editions. A premium signed and numbered print denoted by the abbreviation A/P. A premium signed and numbered print which includes a small original drawing or painting in the margin area. = Place your order securely online with any major credit card. 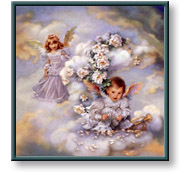 Heavenly Hideaway is a classic example of the exquisite detail and angelic children found in Sandra Kuck's paintings. This is one of three paintings in her 1998 Angel Collection. The other two prints in the collection are Angels' Prayer and Angels of Joy. Image Size: 11" x 11"
Immediately go to the top of this page. Currently we accept all 4 major credit cards: Visa, MasterCard, American Express, and Discover. orders must be in U.S. funds if purchased outside the United States. This website was designed by David's Web Creations. Heavenly Hideaway copyright © 1998 by Sandra Kuck is prohibited from being copied. All applicable copyright © laws apply and are reserved by artist Sandra Kuck. Web pages copyright © 1998-2011 by Christ-Centered Mall, Inc. All rights reserved.